Worried about how to manage on-leash greetings? Chances are, you’ve searched online how to do it, and I’d be willing to bet the farm that you’ve come across a whole bunch of articles saying that dogs should never meet each other while they’re on a leash. This is ridiculous. It’s just another example of the clicker crowd not teaching their dogs self-control and discipline—and then completely avoiding all the situations that arise from dogs not being properly trained. I think having dogs meet when they’re on-leash is a great idea because it’s a good opportunity for training and dogs often love meeting other dogs. Dogs today spend so much time behind fences and on leash being dragged away from other dogs that many of them simply have no idea how to greet other dogs politely. More problematic, this “avoidance” technique only serves to reinforce the problem because the dog gets more and more excited—and often, more and more fearful. I can’t tell you how many people say to me that their dog is fine off-leash, it’s just on-leash. In their heads, it is the leash that’s the problem … not the dog. Big mistake. Leash reactivity is generally caused by fear (along with doorbell barking, fence fighting, and so on). Ultimately, it shouldn’t matter whether the dog is on-leash or off-leash. The naysayers do have one thing right, though: an improper leash greeting can be a source of conflict. That’s why I’m going to walk you through how I have dogs meet each other. First things first, though. Always ask if your dogs can meet before initiating. Put your dog in a sit. The biggest part of training is having your dog focus on YOU. As part of this, YOU need to give permission to your dog to meet another one. Here’s how to do it: Put your dog in a sit and talk to the owner for a few minutes. Ideally, the other dog owner will do the same—but remember, you can’t really control what other dogs and their owners do, just what you and your dog do. So why do you start with a sit and start with the dog focusing on YOU? Because you don’t want a huge amount of inappropriate excitement. That’s the source of a lot of conflict. Instead, you want the dogs to greet each other calmly and appropriately. Only allow a PROPER greeting. What constitutes a proper dog greeting? Generally, dogs don’t approach each other head on. They like to take their time, suss out the situation. The fact is, dogs start communicating the instant they see each other. By the time they get close enough, they’ve already exchanged a lot of information. Next up? They’ll sniff each other’s’ face. (There’s an enormous amount of information in the breath.) From there, they’ll move on to the rear end sniff. Here’s how to proceed: After you’ve had your dog sit for a little bit, release him to meet the other dog with a command like “OK,” or “Free.” Let the dogs approach each other—and make sure you keep your leash loose. A tight leash can build frustration and drive. You’ll probably engage in a little bit of “leash dancing” when the dogs are getting to know each other and you and the other owner are keeping the leashes untangled. Take your time and don’t force a greeting. As you become more experienced, you’ll see all types of dog greetings. With some dogs, your dog will act more dominant, with others, he’ll be more submissive. Some dogs are mainly interested in sniffing the breath and aren’t that interested in the other end. These are all fine—as long as you follow a sit, release, and proper dog greeting that doesn’t go straight for the bootie. Well-trained and well-balanced dogs will always greet each other politely—even if personality-wise, they are not suited to each other. And that brings me to another point: We assume that all dogs will like each other, simply because they’re dogs. Not true. Sometimes, dogs want nothing to do with each other. We need to respect that. Don’t force it. For some reason, I’ve noticed that people seem especially eager to drag puppies over to meet dogs, probably because they’ve been told over and over again that if they don’t socialize their puppies, they’re going to end up with canine Charles Mansons. I can’t tell you how many times I see the owners saying, “Come on! It’s OK!” and then dragging the puppy over to meet the adult dog. Please don’t do this. And if your dog is meeting a puppy, put your dog in a sit or a down and let the puppy come over when it’s ready. Also, take your time. There’s no rush. Sometimes your dog might be in a sit, but still overexcited. Maintain the sit until he calms down. Some dogs may show signs of anxiety (like backing away). Recall your dog and put him back in a sit. In fact, this is one of the best ways to help dogs that are anxious around other dogs. Just have them sit around each other. Get to know your dog’s language. As I said above, dogs start communicating the moment they set eyes on each other. You can tell a lot about another dog (and whether you want your dog to meet him) not just by its body language, but by your own dog’s body language in return. Human perception of dog body language is not infallible. Most online guides to dog body language do people and their dogs a huge disservice because of how simplistic they are. That said, once you start paying close attention to your dog and his or her language, I can guarantee that it will open up a new world of understanding. The thing you have to understand is that dogs are pack animals. They want to know exactly where they stand in the grand scheme of things. (This is why they respond so well to good balanced training—they know exactly where they stand.) Every time two dogs meet, they negotiate their standing. They have a “conversation” about who is dominant and who is submissive—and they do that through their body language, including stance, ear position, tail position, and so on. I want to note that dominance and submission are completely neutral terms in the dog world; they are simply a description of how dogs relate to each other. There’s nothing inherently bad about either one. Yet many positive people don’t like talking about them because they assign human values to the words. So dominance becomes synonymous with aggression, and submission becomes fear or anxiety. Even worse, there seem to be people who think that if you even USE the word dominance in the context of understanding dog behavior, then you’re a dominance trainer who is beating dogs into learned helplessness. I’m going to assume that you don’t want to roll around in dead fish carcasses or sniff other peoples’ heinies either. That’s because we’re not dogs. Newsflash here: Dogs aren’t people either. Now think about this: Your dog ALSO wants to know his or her position in relation to YOU. Generally, I steer clear of using terms alpha, pack leader, and so on. This is partially because the positive people have hijacked them so that most people associate them with abuse. Also, as much as I hate the purely positive movement, I also hate people who use the idea of being alpha as an excuse to whale on their dogs. Nonetheless, any of these terms are as good as the other when it comes to describing how your dog sees the world. We have to get over this notion that the term submissive equals fearful, unsure, anxious, or what have you. This is not to say that it can’t signify those things, just that most purely positive training seems to be based on a faulty perception of what’s happening. Situation #1: You come home from work, and your dog is super happy to see you. He runs over. His body is slightly low slung, his ears are back or to the side, and that tail is wagging back and forth and it’s slightly down. In other words, your dog is ecstatic you’re home and is approaching you in a submissive posture because you are the SHIZNIT. Situation #2: You’re training your dog with me. Her heel is perfect. Her auto-sit is flawless. Her body is slightly lower to the ground, ears are back or to the side, and tail is mid-body. In other words, your dog is thrilled to be doing her “job” so well and is displaying a slightly submissive posture because you are the SHIZNIT. Where the rubber (leash) hits the road. You may be wondering why I’m going on about all this stuff in what should be a relatively short piece on dog greetings. 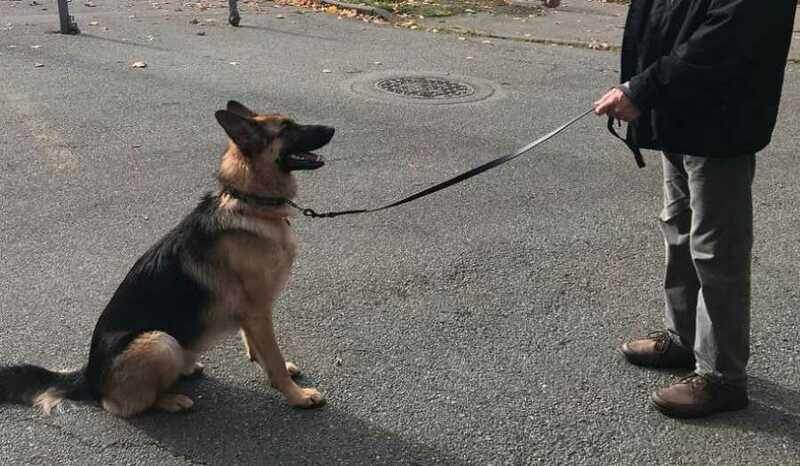 Here’s the issue: How to do on-leash greetings is one of the most common questions I get. It’s also the one where I get the most amount of pushback from clients. It’s not that they can’t deliver a correction properly, or even that they don’t want to. It’s that they’re afraid to. Then there are the “quietly concerned” people who oh-so-gently try to educate you on why you should be using a harness or a Gentle Leader. Sure, their tone is quiet, but their (ignorant) judgment is loud and clear. It’s also completely wrong. So I get that it’s hard enough to go against the positive only training tide. And I get that it’s even harder to engage with on-leash dog greetings when so many people seem to think that even though their dog is a window-barking, fence-fighting, leash-reactive basket case, they have a better way. Hang in there. Do it anyway. There will come a time where your dog’s performance will shut them up. Try this: The next time someone accosts you, say, “One moment.” Put your dog in a sit or a down. Then say, “Excuse me?” Usually, this will shut them up because it’s weird for clicker people to see dogs who will perform in public—with or without a treat. But above all, don’t take anything they say to heart. Using a prong collar and delivering a correction does not make you a bad, abusive, dog-hating person. Now get out there and practice some on-leash greetings! * Take a look at Roger Abrantes’ book Dog Language: An Encyclopedia of Canine Behavior, with the caveat that different breeds and individual dogs can show variation from the wolves that he depicts in his picture. (It’s also complicated by the fact that many modern dog breeds have lost some of the body language of wolves.) Still, it’s a useful reference that might help provide some insight into dog interactions and help you read your dog better.